Regan Ralph: "This is why we don’t shape the agenda, we let others shape it"
Why give money to support human rights rather than digging a well? The president and CEO of The Fund for Global Human Rights explains why everyone needs human rights – and why international organisations should take the lead from activists on the ground. This article is part of an editorial partnership with the Fund for Global Human Rights. Democracy and human rights are increasingly under attack around the globe. More than ever, we need dedicated local leaders and organisations able to stand up for the rights of their communities and push for positive social change. But what do these local leaders and organisations need in order to be successful? And how can funders, international organisations, governments and corporations interested in creating social change better enable and support their efforts? openDemocracy and the Fund for Global Human Rights have collaborated on a series of stories exploring these questions. Each week from today until June 2019, we will release a new story, providing insights into what local leaders and grassroots organisations around the globe need from their international allies in order to create transformational change in their communities. 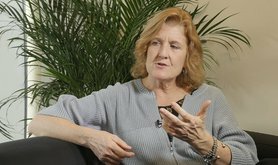 To kick off the series we are sharing a video interview between Mary Fitzgerald, editor-in-chief of openDemocracy, and Regan Ralph, president and CEO of the Fund for Global Human Rights. In it, they discuss the role of donors in supporting local activists pushing for systemic change. Stay tuned to openDemocracy and the Fund’s partnership hub for weekly insights from the frontlines of social change.